A recycling project is a project where post consumer or secondary materials are used to produce a value-added finished product or, intermediate processing of recovered material is provided. A value added recycled product is one in which the raw materials have increased their value through a change in their character or composition through a manufacturing process. Green Waste Recycle Yard diverts urban logs from landfills, mills them into dimensional lumber products, and creates mulches for landscape and construction projects. GWRY recovers urban logs from the Greater San Francisco Bay Area and recycles urban logs that are destined to the West Contra Costa Sanitary Landfill and other nearby California landfills. Tree service operators and contractors, urban landscape designers and planners, various public works departments within the greater San Francisco bay area such as Caltrans, large property owners such as California State University, University of California, homeowners’ associations, cemetery operators, homeowners, etc. are typical customers. Storm damaged trees are a natural source of material. Most urban trees are removed because they are dead or dying or because of “hardscape” damage i.e. tree roots that damage sidewalks, buildings, underground pipes, etc. GWRY receives urban tree logs from our own parent company, The Professional Tree Care Company, as well as from similar tree services, landscaping contractors, commercial facilities managers and municipalities throughout the greater San Francisco Bay area. GWRY carries forward the Bay Area urban tree milling tradition of PAL Foundation, the East Bay Conservation Corp and New Life Millworks. Green Waste Recycle Yard's 100% recycled urban forest products were featured in the Sunset® Magazine sponsored showcase of celebrated architect Michelle Kaufmann's mkLotus modular home. The eco-friendly, prefabricated showhouse was displayed in San Francisco's Civic Center Plaza as part of West Coast Green Expo 2007. Green Waste Recycle Yard provided the retaining walls and infill mulch for the surrounding sustainable garden, designed by Nick Thayer of Late Afternoon Garden Design. As with all Green Waste Recycle Yard products, the milled lumber and Treeincarnation mulch are made entirely from local urban forest trees that would otherwise have ended up in landfills. The lumber and mulch were donated to charity and civic causes following the show. 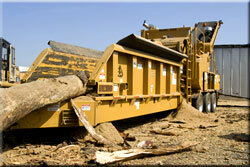 We mill urban logs into dimensional lumber products and create mulches for landscape and construction projects. We prepare urban logs for milling including sorting, grading, scaling to mill size specifications of 14’, 17’ and 21’. We grind left-over urban logs into woodchips and mulch for landscaping use and any residual that cannot be re-used (about 1 to 10 percent) is used for co-generation plant woodfuel. Proudly Listed as a green resource for San Francisco Green Schoolyard Alliance (SFGSA). ©2013 Arboricultural Specialties, Inc. dba Green Waste Recycle Yard. All rights reserved.